Dr. Sol Taylor: Where Have All the Silver Coins Gone? Where Have All the Silver Coins Gone? You can quickly tell if your "silver" coins are really silver by turning them on edge. Dimes, quarters and half dollars minted through 1964 are 90-percent silver and are worth more than face value today; their edge appears all-silver, top. Halves dated 1965-70 are 40-percent silver; their edge appears silver with a line of gray or black, middle. 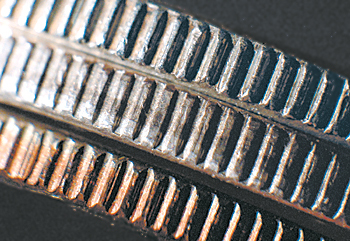 Dimes and quarters after 1964 and halves after 1970 are a copper-nickel alloy with little intrinsic (metal) value; their edge appears silver and copper, bottom. Photo by Eddie Sadiwa and Leon Worden / The Signal. hen the Kennedy half dollar was released in 1964, it was to be the last of the 90-percent silver half dollars minted for general circulation. It was the end of a long-running era of silver coins going back to 1793. By 1970, silver coins were still found in daily use, but in declining numbers as compared to a few years earlier. The price of silver was on its way up from the long-fixed price of 91 cents per ounce prior to 1964, to $1.29 after 1964. The new dimes, quarters and halves were made with a copper nickel coating over a copper core  commonly referred to as "clad" coinage. The half dollars of 1965 through 1970 were clad coins, but still contained 40 percent silver. Starting in 1971, these coins, too, became silverless. Through most of the 1970s, the price of sliver rose, and by late 1979, silver speculation was at a fever pitch. Huge price jumps were recorded on a weekly and even daily basis. In early 1980, many coin and jewelry shops posted their daily buying prices for silver coins, sterling silver jewelry and scrap silver, as well as gold coins and jewelry  since gold, too, was on a rapid climb. Peak prices of $48 per ounce were reached by 1980 for silver, and over $900 an ounce for gold. In this frantic period, probably 99.99 percent of all circulating silver coins had been pulled out of circulation and either melted or, in the case of mint-condition rolls and better-date coins, put away. The removal of silver coins from commerce coincided with other countries switching to non-silver coinage. Canada's 1967 centennial coinage included the last of its silver dollars as well as silver dimes, quarters and halves. Great Britain abandoned silver a few years earlier, as had almost all other Western countries. Today, with silver prices in the $6 to $7 range, silver coins bring about five times their face value. Less than a year ago, with silver prices in the low $4 range, silver coins were bid at about three times face value. Many of the silver coins melted in the 1970s and 1980s became pure (.999) silver bars  often one-ounce bars all the way up to 100-ounce ingots. In he early 1980s, many .999 silver "rounds" were issued by various private mints to honor different people, places and events. These are traded today based on their silver value, not their numismatic value  although some early silver bars bring a premium well above their silver value. To find a silver dime, quarter or half dollar today is quite a rarity  not that the coin itself is rare. Nearly all those of average usage have been converted into pure silver bars, ingots or rounds. The same is true for sterling silverware and jewelry. The remaining silver coins are either in partial or complete collections, or in mint condition, held by speculators or collectors. Compared to prices in 1980, silver coins today are a real bargain.